Adele is the biggest winner on the recent Grammy Awards 2012 banging of 6 awards including the big three awards: Song and Record of the Year for "Rolling in the deep" and Album of the Year for "21". Adele gave also her wow performance even-though she had undergone throat surgery, all eyes and ears on her when the spotlight was focus on her, as she sung "Rolling in the deep" with a little dance and waving of hands, Adele really raised the roof with overwhelmed standing ovations. Adele is the only singer to date that never make a gimmick for fame, she had an amazing voice that makes the world stop just to hear her sing, she also looks so chic and glam in black dress by Armani, I wonder now what will Karl Lagerfeld's thought after criticizing her to be "A little too fat" while praising the other model-singer Lana del Ray. 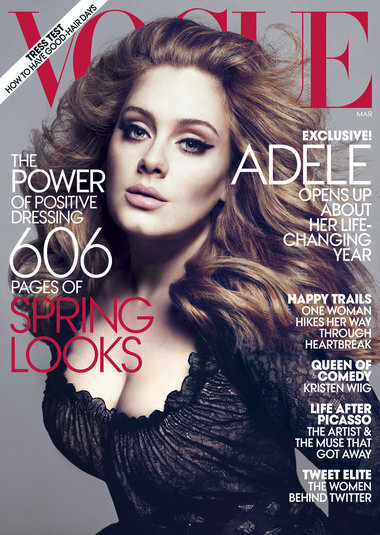 Adele will be on cover of Vogue Magazine of March issue, she also told her critics that she will represents the majority of women when concerning about her weight and doesn't want to look like a model on the cover. But the cover turns out to be stunning and I believe that the issue will sold out like a hot cake. YES! Adele! She is awesome. yehey humakot si adele she's so good!! I adore her so much! !